Innerzyme’s Pain & Inflammation Blend is a highly recommended, high potency, systemic enzyme formula that works throughout the entire body. Its enteric-coated delivery system protects the enzyme activity for optimal and maximum absorption. Not to mention the consistent quality and low daily dosages. One bottle of Innerzyme’s Pain & Inflammation Blend is a two month supply. 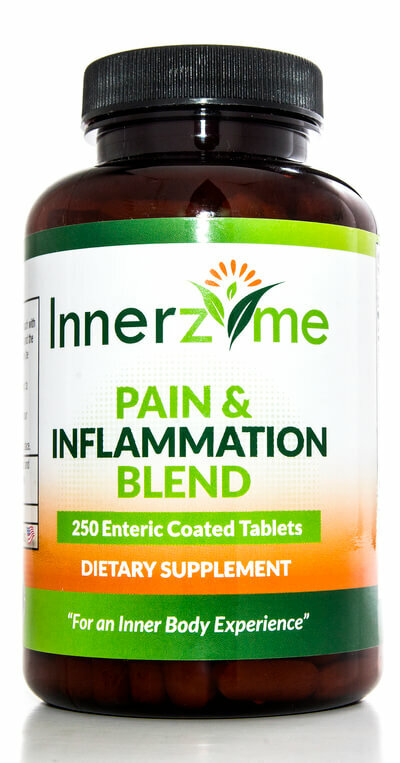 Innerzyme’s Pain & Inflammation Blend is a comprehensive blend of proteolytic enzymes, herbs and bioflavonoids. It is enhanced with Turmeric and White Willow Bark. When caring for injuries and during recovery following an operation, “it is important to apply medications for reducing the swelling and anti-inflammatory as well as fibrinolytic agents. If possible, such treatment should produce no adverse effects and should further the healing processes of the organism” (Wrba, H. & Pecher, O., Enzymes-A Drug of the Future, pg.75). There are no side effects with Innerzyme’s Pain & Inflammation Blend. It is a safe and natural solution for post-operative scar tissue, inflammation and pain whether the surgery was recent or 15+ years ago. *These statements have not been evaluated by the Food and Drug Administration. This product and information is not intended to diagnose, treat, imply, cure or prevent any disease.